The aesthetic neuromodulator, Botox, is the ‘Coke’ of all such injectable drugs. It was the first such type of injection approved for aesthetic facial use and dominates the market today, both in sales as well as branding. It is so ingrained into doctor and patient mindsets that term, ‘Botoxed’, is instantly associated with what it does. While several competitor neuromodulators injections have become clinically available, their clinical effects are largely similar. Without a substantial cost difference it has been hard for these competitors to make major inroads into Botox’s marketshare. Thus they remain as the “Pepsi’ of such drugs compared to Botox’s market dominance. In the April 2019 issue of the Aesthetic Surgery Journal, a clinical study was published entitled ‘A Multicenter, Randomized, Double-Blind, Placebo-Controlled, Single-Dose, Phase III, Non-Inferiority Study Comparing PrabotulinumtoxinA and OnabotulinumtoxinA for the Treatment of Moderate to Severe Glabellar Lines in Adult Subjects’. 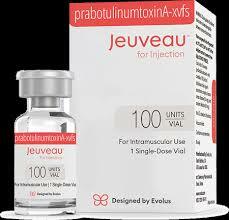 In this study the authors evaluated a new neuromodulatir injection, PrabotulinumtoxinA (Jeuveau) which is a 900 kDa botulinum toxin type A produced by Clostridium botulinum, to that of onabotulinumtoxinA (Botox) to determine its safety and effectiveness in the treatment of glabellar lines. In a 5 monthmulticenter, double-blind, controlled, single-dose Phase III study. over 500 patients with glabellar frown lines were studied. They were randomized into two large groups of cost to 250 patients each receiving 20 U prabotulinumtoxinA and 20 U onabotulinumtoxinA. A smaller number (50) received a placebo. placebo. Effectiveness was determined by substantial glabellar wrinkle line reduction at one month after injection. Their results showed a response rate of 87%, 83% and 4% for prabotulinumtoxinA, onabotulinumtoxinA, and placebo groups, respectively. Only 1% of the patients experienced a adverse event which was determined to not be related to the drugs used in the study. This study demonstrates that 20 units of prabotulinumtoxinA was comparable to 20 units of onabotulinumtoxinA in the treatment of aesthetically significant vertical glabellar wrinkle lines. We should expect to this fourth aesthetic neuromodulator injection available in the U.S. later this spring.